The very moment that I saw these napkins come into Pier 1 I knew there was going to be a tablescape using them. 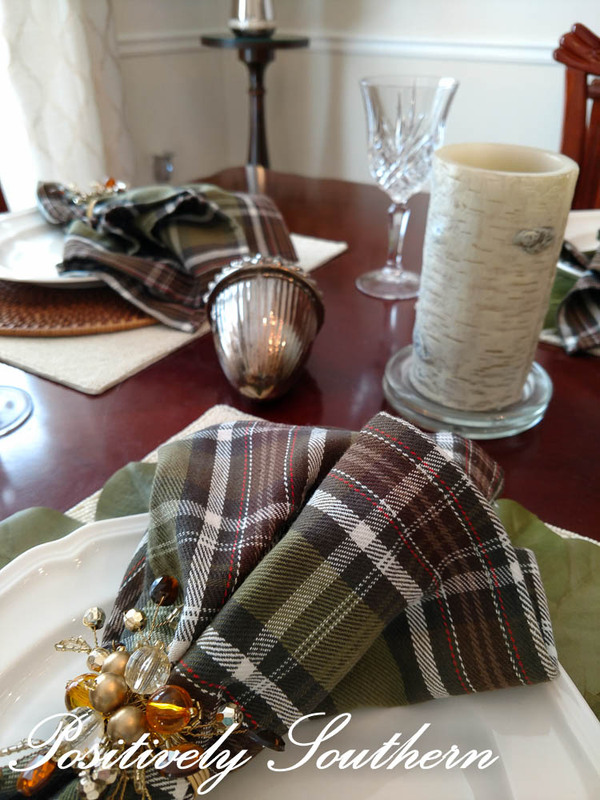 The colors and the plaid in the napkin were visually masculine, something I'd never done before in a tablescape. My desire was to stay as true to that feeling as I could. Since this was a bit out of the norm for my usual tablescaping, I decided to not make a quick decision on what other elements I'd use. I simply laid the napkin out and let it lay there while my creativity simmered. I always try to use pieces I already have to reduce the need for more stuff. The beaded placemats have been in my stash since last year. 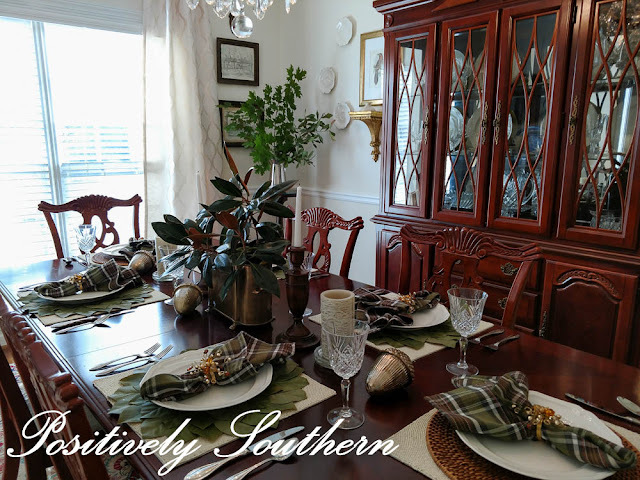 They brought a light and brightness to what could be a darker tablescape. I only have 2 of the rattan chargers so I decided I needed to see what else I could find that would work. 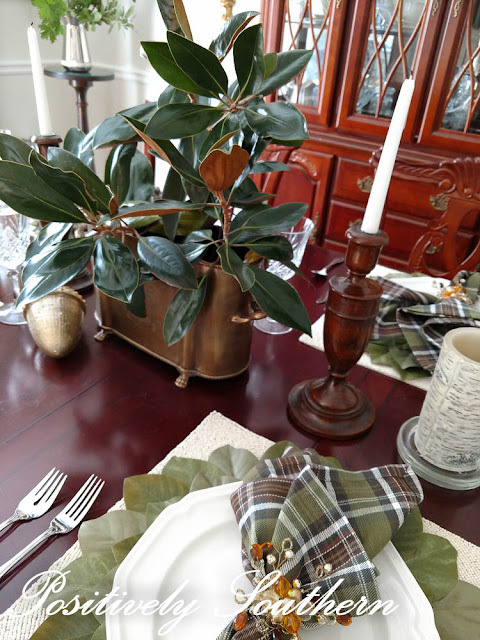 The leaf placemats are new to Pier 1 this season. 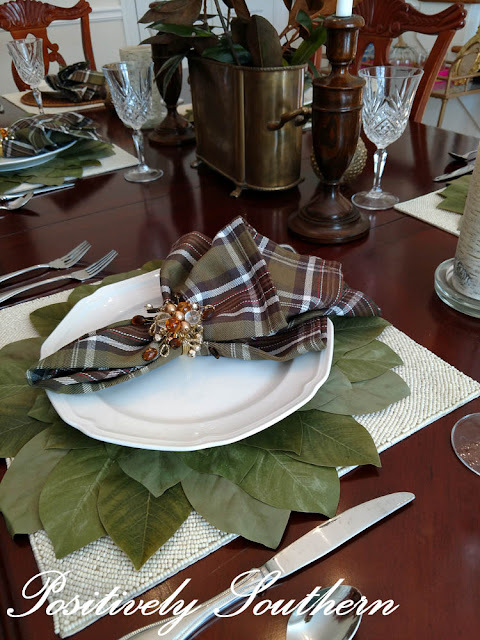 When I saw those and realized they matched the napkins I knew I now had a theme to the tablescape. In keeping with my "green theme" I dashed out to the yard and snipped a few branches off a couple different trees. 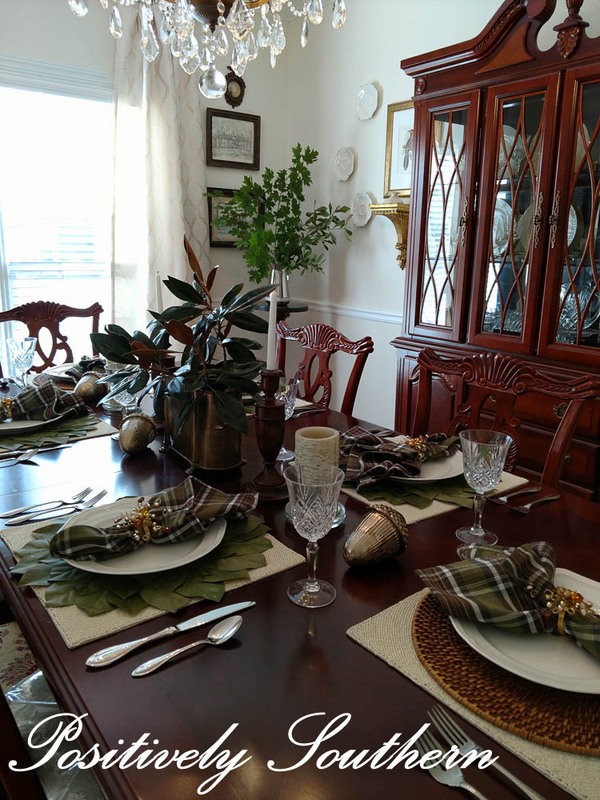 The double wine chiller serves as a container for the centerpiece. Just a couple of magnolia branches gives a natural, effortless look. Here's hoping that the week of Thanksgiving I can find a few branches to stuff back in there! Lest you think I purchase all this stuff at full price and as soon as they come into the store here is a rundown of my sale items. 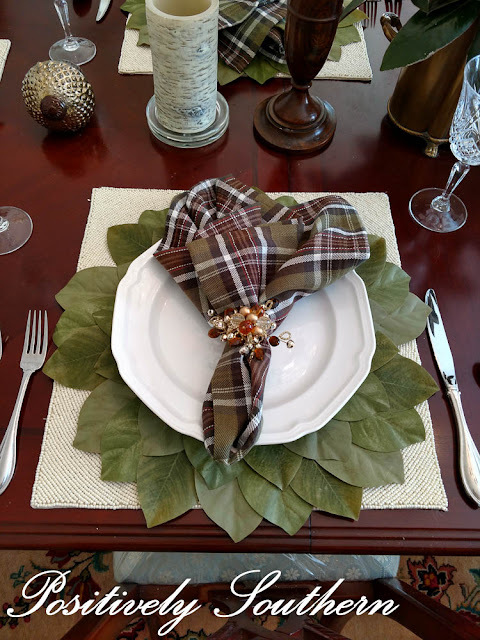 The napkins rings were .98 each along about March I think leftover from fall. 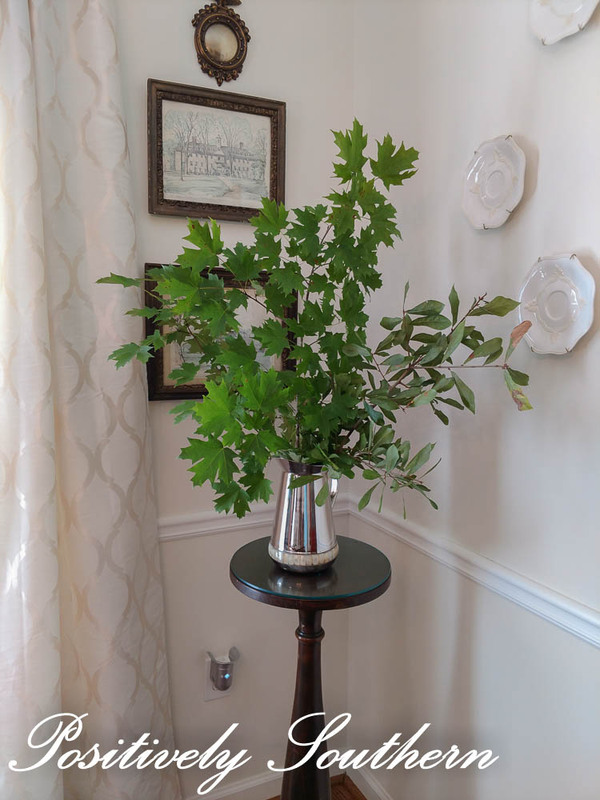 The mercury glass acorns were $2.98 each and those birch candles I waited all summer for those to come down in price, I think they were maybe $6. I am anything if not patient, I will wait and watch for sales and I always buy off season!!! Right now I'm watching beachy stuff that we have left from the summer! I love this one. Great job. I keep on an eye on the Pier 1 items when they go on sale too. They have great stuff..I always check it out when out of season. A little late viewing this but I love it. The word "dapper" comes to mind. Great sales, great buys.